IU School of Journalism professor Jim Kelly and two journalism students talked about a class that took a dozen students to Kenya last summer to learn about reporting the HIV/AIDS epidemic at the Bloomington Press Club meeting Nov. 22 in the State Room East at the Indiana Memorial Union. Using a photo slideshow, Kelly described the course and the trip, the first of the School of Journalism’s courses to take students to Africa. But to report on health care issues, specifically HIV/AIDS, nowhere is more central to the issue than sub-Saharan Africa, he said, where rates of infection are among the highest in the world. Kelly devised the course and travel component based on his own experiences leading workshops for journalists in Africa and Asia. For this course, he partnered with IU’s AMPATH project, which works in Eldoret, Kenya, to improve access to health care. “Before the trip, we had guest speakers in class who talked to us about what to expect, about AMPATH and other topics,” Kelly said. Students also read about the region, the epidemic and current issues before embarking on the three-week trip. The students did have a secret weapon waiting on them, though: Moi University students. “In keeping with the AMPATH model, where local organizations pair with medical schools, the students paired with their counterparts at Moi University in Eldoret,” he said. Working in teams of two, IU students and Moi students developed story ideas and then conducted newsgathering. For most, each pair set off each morning to interview people at agencies or medical facilities, or to travel to villages to interview local people facing the disease or dealing with it in their families. Many of these villages were remote, Sargent said, places where a bus would drop off the two who then faced a long walk to villages. Returning to IU House in Eldoret, the teams plotted their stories and photo packages. 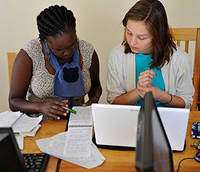 The resulting work was posted on the class blog, which students update while in Kenya, then polished and posted their final projects after their return. Kelly plans to offer the course with the travel component in summer 2011. Link to the students’ blog. Learn more about Kelly’s workshops. Read about IU’s AMPATH project. This entry was posted on Thursday, November 25th, 2010 at 5:59 pm and is filed under Guest speakers. You can follow any responses to this entry through the RSS 2.0 feed. Both comments and pings are currently closed.